Taste test: These are extremely flavorful. 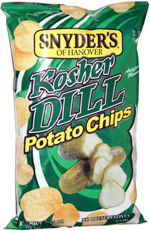 They taste like a giant kosher pickle that you'd get in a New York deli. At first, it tastes like a salt and vinegar chip, but then you get a pickle aftertaste. Then, after a while, it reminds you of Rye bread. Comments from our taste testers: "Can you say 'floor of a cab'? " ... "Delicious!" ... "Picklelicious" ... "It's like the tasty combination of chips with spilled pickle juice on them."